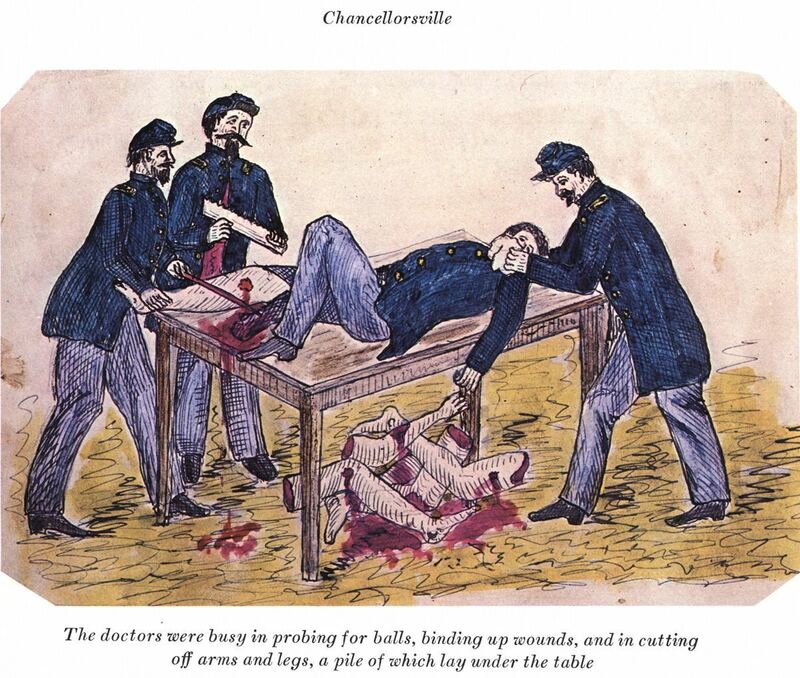 Amputation was the most common Civil War surgical procedure. Union surgeons performed approximately 30,000 compared to just over 16,000 by American surgeons in World War II. The general lay on a pile of rocks while two badly wounded soldiers nearby cried out for help until stretcher bearers finally arrived on the scene. Despite their own painful wounds, the two men insisted Ewell be carried off first, but he instructed the litter bearers to take them away. 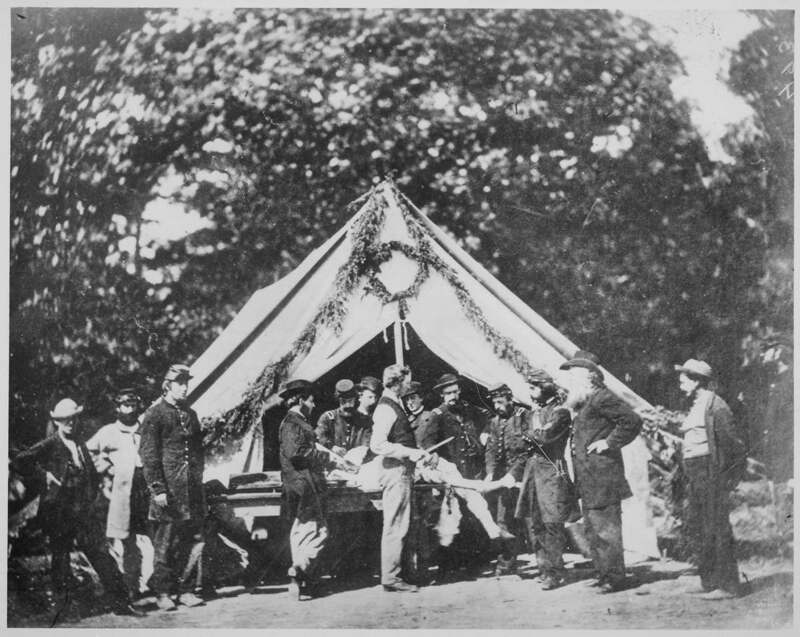 Hours after being wounded, Ewell was finally placed on a stretcher and taken to the rear. 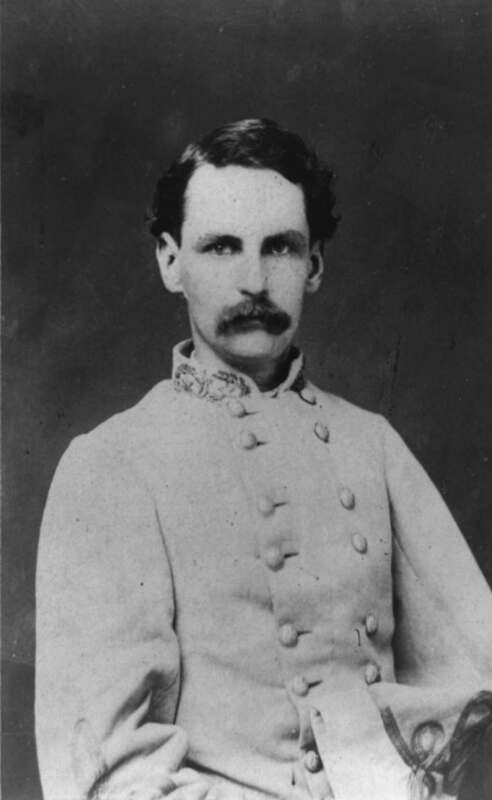 Dr. Hunter McGuire, Gen. Thomas J. “Stonewall” Jackson’s medical director, amputated Ewell’s leg the next day. 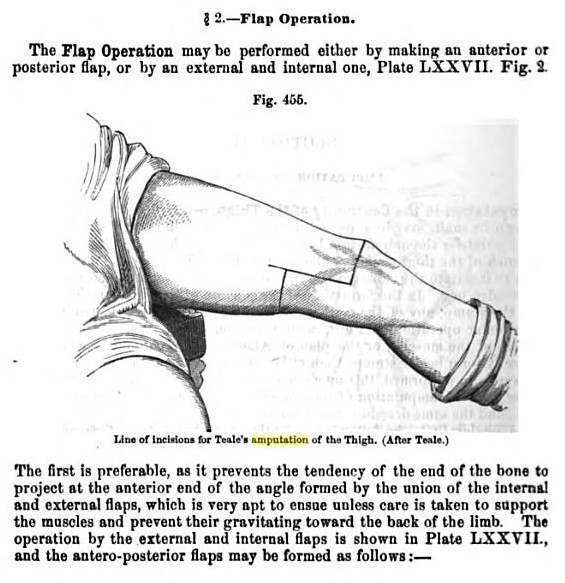 There were 2 main methods used to amputate large limbs during the War: Flap and Circular Amputations. In the field the flap method was more widely used where time was a factor. 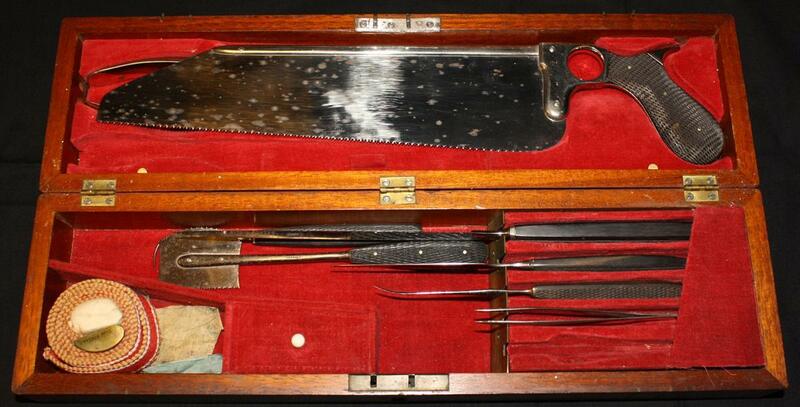 With this method the bone was dissected and flaps of deep muscle and skin were used to close the operation. When implementing the flap method it was imperative to cut the bone away a few inches above the place where the flaps were brought together. 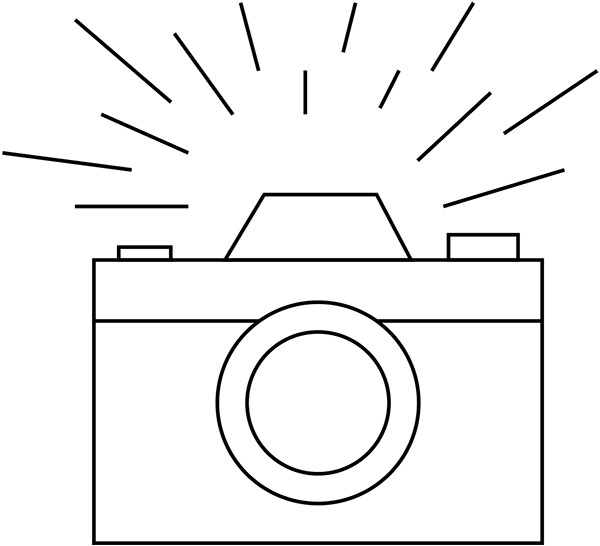 This series of photographs, compiled by the U.S. Surgeon General’s Office, illustrates the different types of arm amputations. 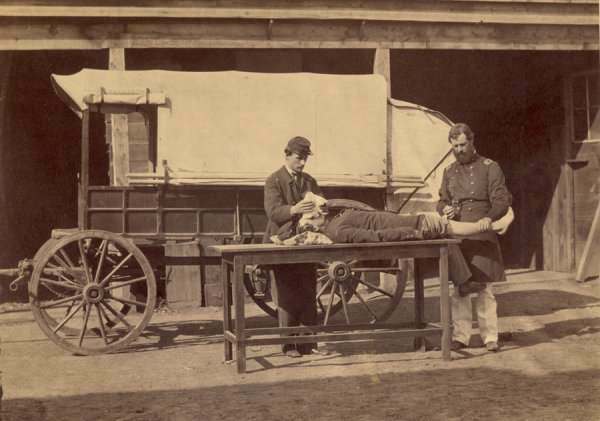 “Army Medical Wagon.” Demonstration of the use of anesthesia in amputations. 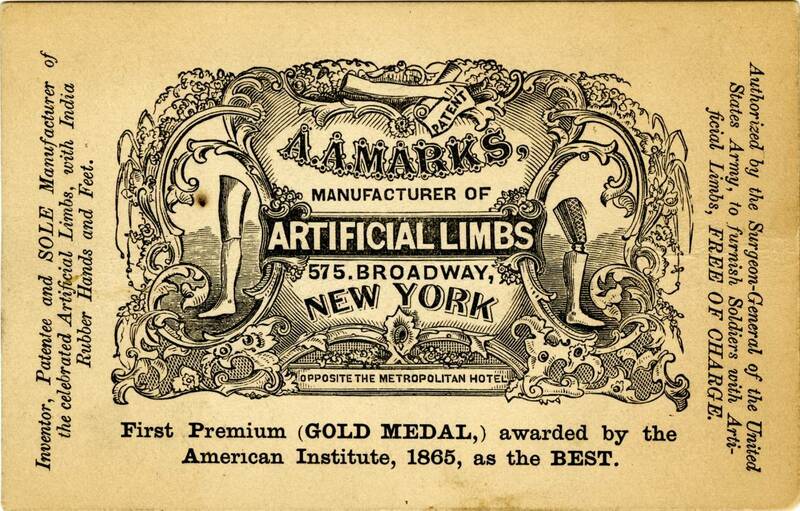 Many did not want a false limb. 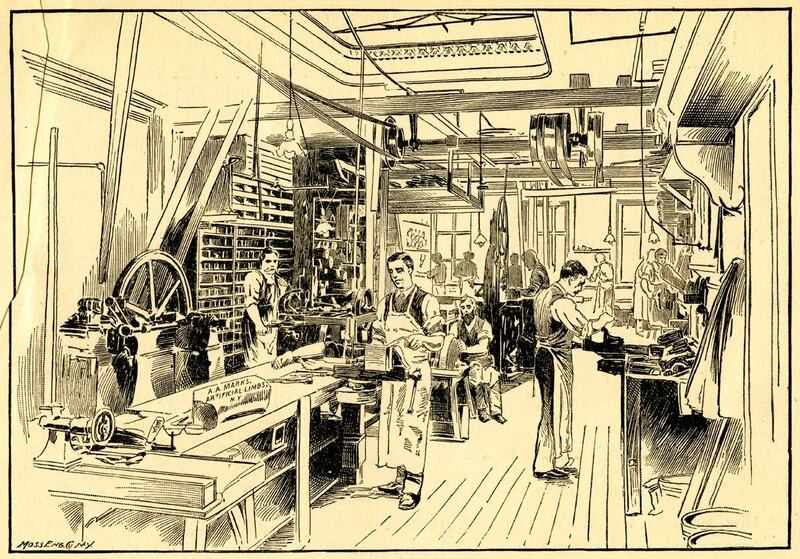 A large proportion of disabled veterans in both the North and the South did not wear artificial limbs. Many did not even apply for the money they were eligible to collect because of negative attitudes to the idea of charity. Moreover, pinning up an empty sleeve or trouser leg, instead of hiding the injury with a prosthesis, made their sacrifice visible. 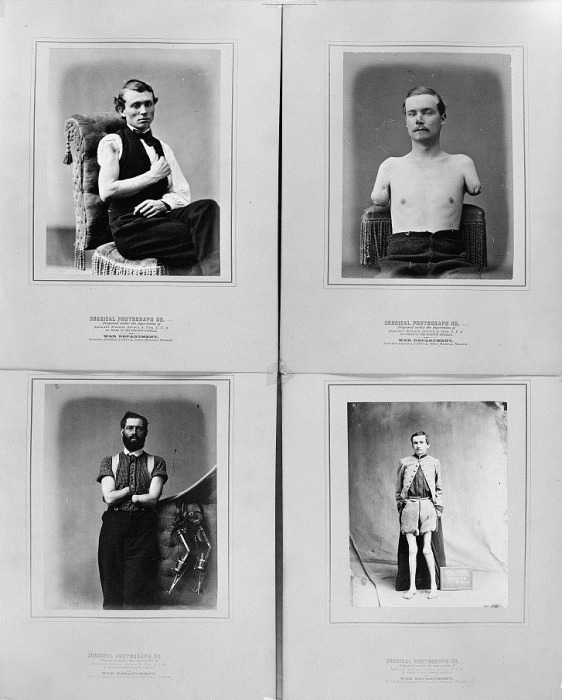 Displaying an “honorable scar” in this way, especially during and immediately after the war, helped amputees to assert their contribution to the cause. Veterans who had lost an arm learned to use their remaining limb instead, and could utilize specially-designed devices to tackle everyday tasks. 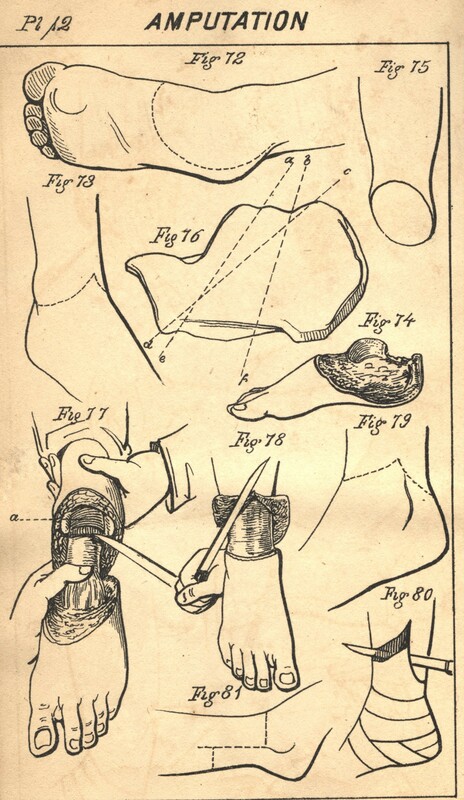 Such strategies were especially important because many prosthetic designs had only limited function and could also be uncomfortable, particularly if the wounds from injury or surgery had healed badly. Moreover, an artificial limb might prove too expensive to repair or replace over the course of a lifetime. 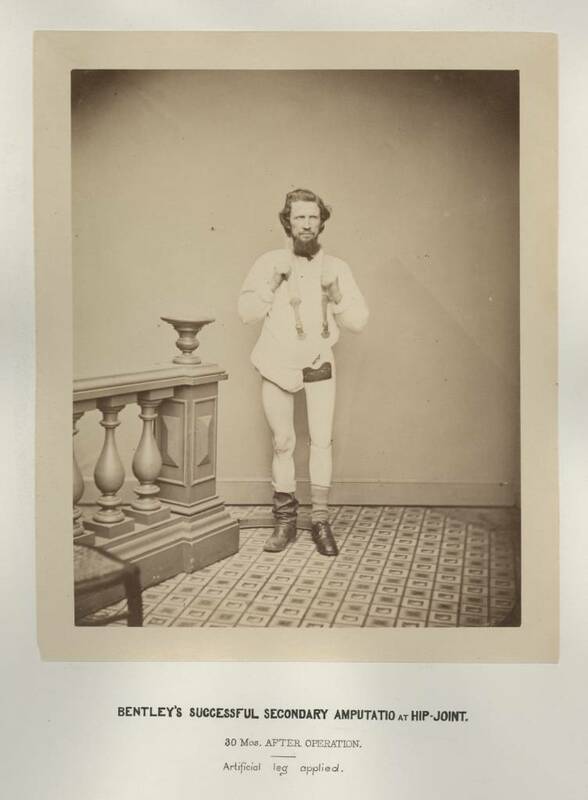 Lucius Fairchild lost his left arm on the first day of the Battle of Gettysburg in 1863. He was elected Governor of Wisconsin in 1866. Major General Daniel E. Sickles (above), Union Third Army Corps commander, was struck by a cannonball during the battle of Gettysburg. Sickles was on horseback when the 12-pound ball severely fractured his lower right leg. 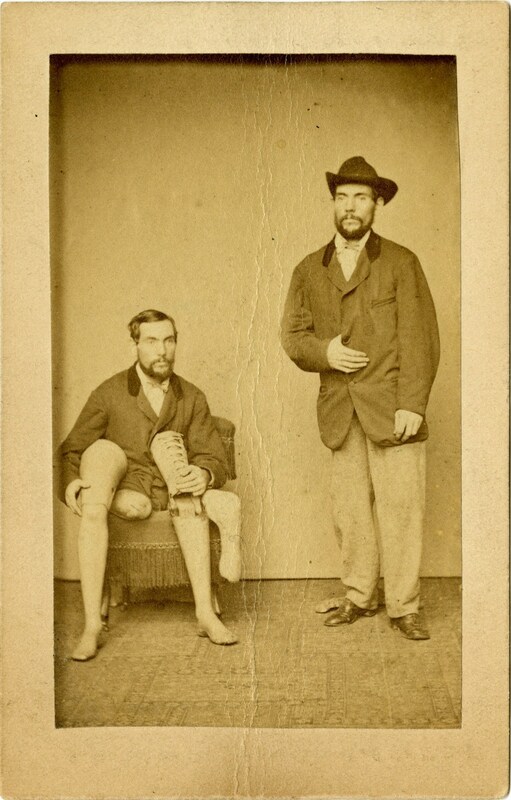 Sickles quieted his horse, dismounted, and was taken to a shelter where Surgeon Thomas Sims amputated the leg just above the knee. 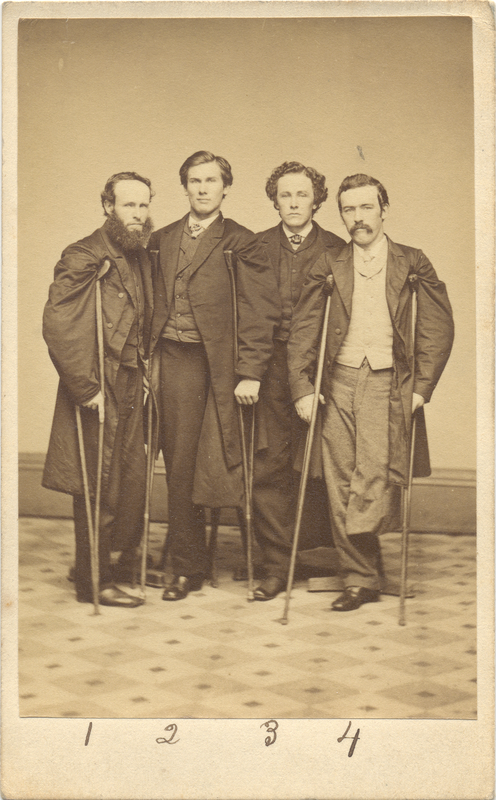 Shortly after the operation, the Army Medical Museum received Sickles’ leg in a small box bearing a visiting card with the message “With the compliments of Major General D.E.S.” The amputation healed rapidly and by September of 1863 Sickles returned to military service. 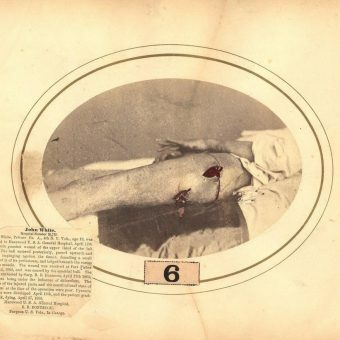 For many years on the anniversary of the amputation, Sickles visited his leg at the museum. 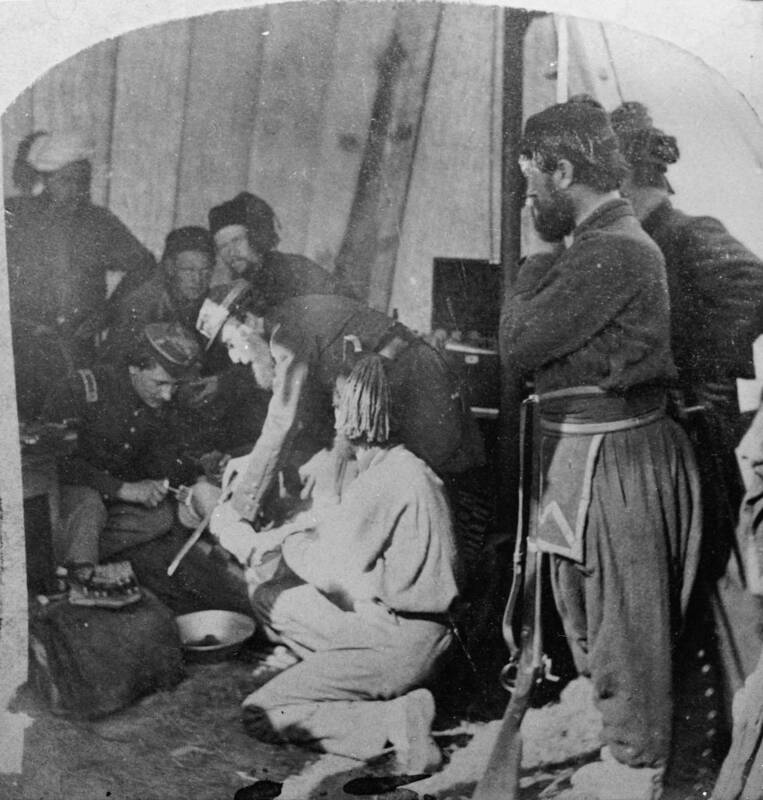 Sickles was photographed in 1865 at the Army Medical Museum. William Bell. Woodward 1760. Sickles’ exploits extended beyond the Civil War. He was the first defendant to successfully use the temporary insanity defense in the United States. In 1859, Sickles was found not guilty of the murder of his wife’s lover, Philip Barton Key, the son of the composer of the national anthem. Sickles had shot Key in Lafayette Square in Washington in a jealous rage after learning of the affair. Sickles served as a secret agent for President Lincoln and was appointed Ambassador to Spain by President Grant. 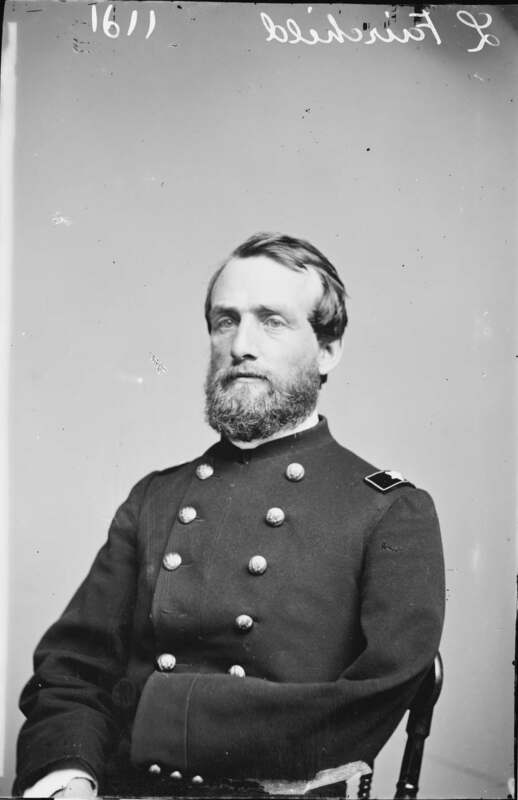 Francis R. T. Nichols lost an arm and a foot in separate Civil War battles. He became Governor of Louisiana in 1877. Private Columbus Rush, Company C, 21st Georgia (above), age 22, was wounded during the assault on Fort Stedman, Virginia, on March 25, 1865 by a shell fragment that fractured both the right leg below the knee and the left kneecap. Both limbs were amputated above the knees on the same day. 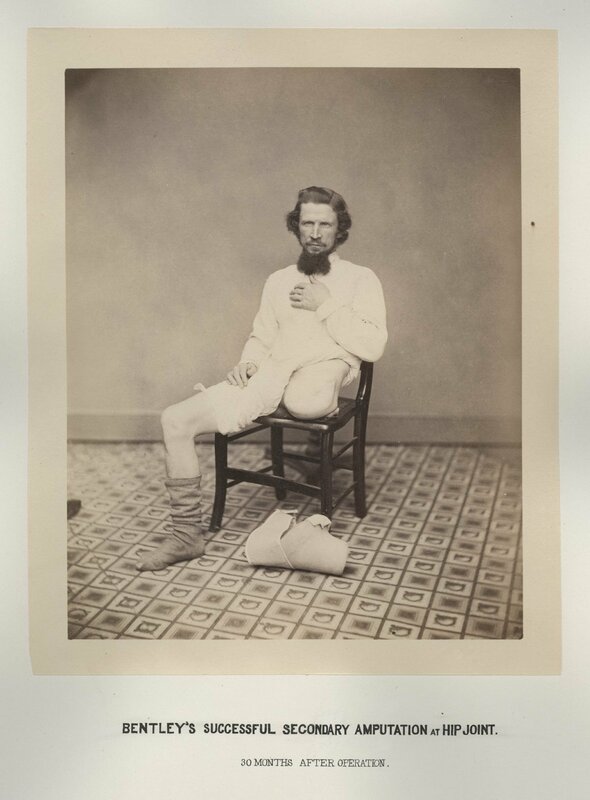 He recovered quickly and was discharged from Lincoln Hospital in Washington on Aug. 2, 1865. 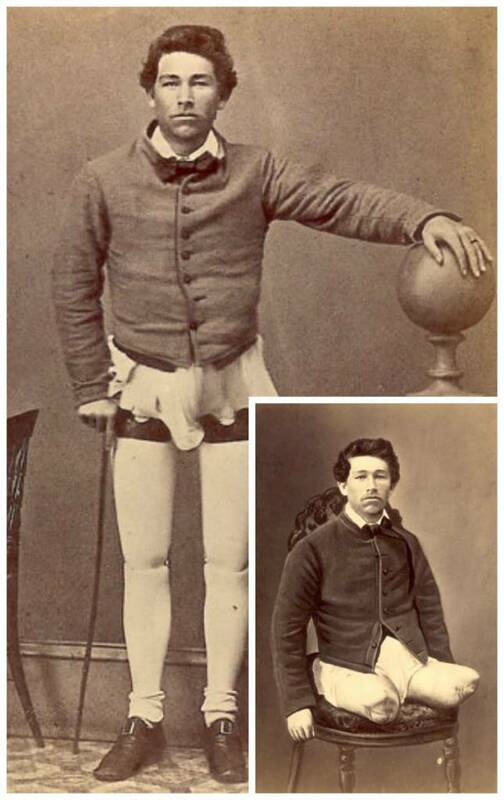 In 1866, while being treated at St. Luke’s Hospital in New York City, he was outfitted with artificial limbs. 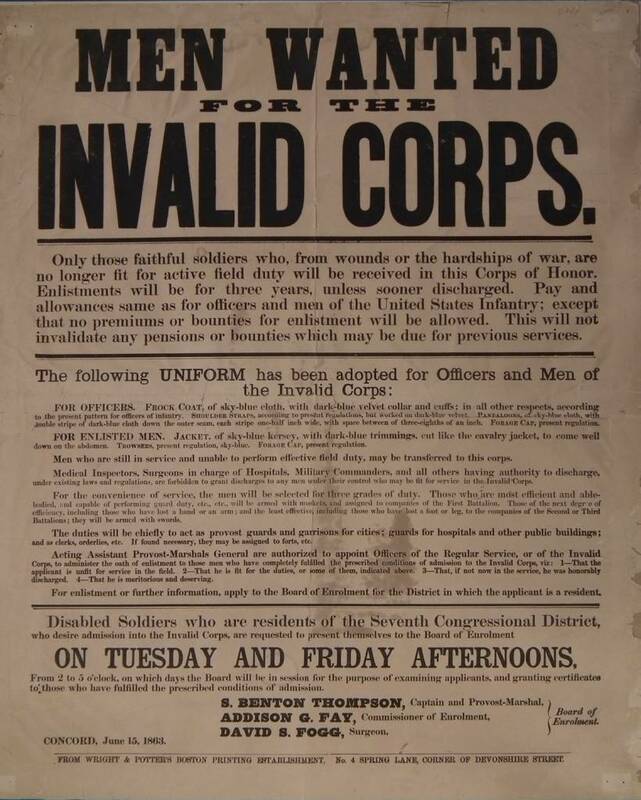 The Invalid Corps was established by the federal government in 1863 to employ disabled veterans in war-related work. Soldiers were divided up into two battalions, based on the extent of their injuries. The first carried weapons and fought in combat.